Presenting: Awbury’s 2018 series on pollinators– from wasps to wind! Monthly articles will correspond with our programming and our “Pollinators FOUND at Awbury Arboretum” art show and scavenger hunt. Our first pollinator of the year for the month of January is a tiny creature almost synonymous with the term ‘pollination’ – yes, it’s the honeybee! 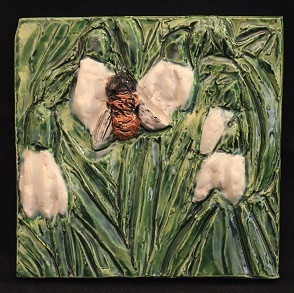 Karen Singer’s beautiful tilework this month depicts the symbiotic relationship between a honeybee and snowdrop flowers. especially for crops all over the world (Sartore). Insect pollination, comprised mostly of these little winged insects, is necessary to one third of the world’s food supply (Sartore). Honeybees are responsible for much of the produce we find in our own kitchens, including apples, pears, nuts, strawberries, tomatoes, peppers, blueberries, squash, and melons. Honeybees also produce two other goods that have widespread human uses – beeswax and honey (“Native Pollinators” 3). 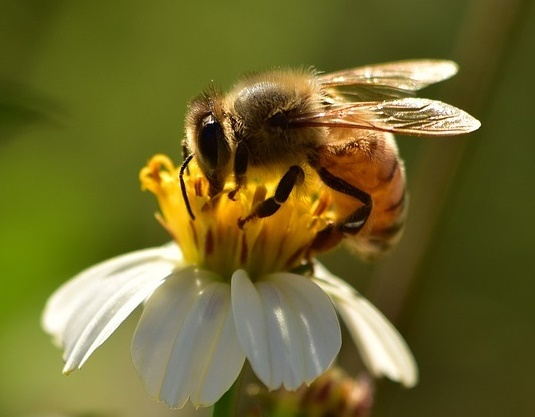 But while honeybees work to produce tasty fruits and vegetables and other products for our uses, they are a crucial cog in the natural processes of any healthy terrestrial ecosystem. Like humans, honeybees function as a social community, and each insect has a specific role that must be carried out in order to maintain both the colony and the ecosystem. Worker bees – females that are sexually underdeveloped – collect pollen and nectar, build and clean hives, and circulate air by beating their wings (Sartore). Queen bees have the crucial role of laying eggs to create generations of new pollinators (Sartore). And drones – the male bees – live in the hive until the winter months when they are expelled for leaner food consumption (Sartore). How can you help these little critters that do so much for the environment? Learn how to plant smart! You can aid honeybees in your own backyard by planting the right types of diverse native plant species and avoiding pesticides during bloom seasons so that these important pollinators have the right things they need to flourish (Reel). Take into consideration the time of flowering, the flower’s color, and the size of each plant to maximize pollination (Reel). Click the links below for tips on how to plant a garden fit for a Queen bee! Sartore, Joel. National Geographic Photo Ark. “Honeybee.” National Geographic, National Geographic Partners, LLC, 10 June 2011, www.nationalgeographic.com/animals/invertebrates/h/honeybee/. “Native Pollinators.” Fish and Wildlife Habitat Management Leaflet , 2005, pp. 1–4., plants.usda.gov/pollinators/Native_Pollinators.pdf. Reel, Susan. “Attracting Native Pollinators to Your Garden Using Native Plants.” www.fs.fed.us/wildflowers/pollinators/documents/AttractingPollinatorsEasternUS_V1.pdf.